A floppy disc is a magnetic storage disc used for computers. It was widely used to distribute software, transfer or backup files before early 2000s. Now the floppy drive is replaced by other storage devices, such as compact drives and USB drives. In Windows system, drive A: and B: are reserved for floppy drives, although usually they are not included in current computers. 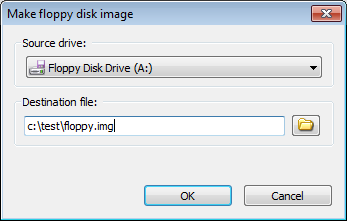 A floppy disc image file is an exact sector-by-sector copy of the floppy disc. It can be used to create a backup of the floppy disc. In virtual machines, a floppy disc image file can be used to transfers files to or from virtual machine systems. 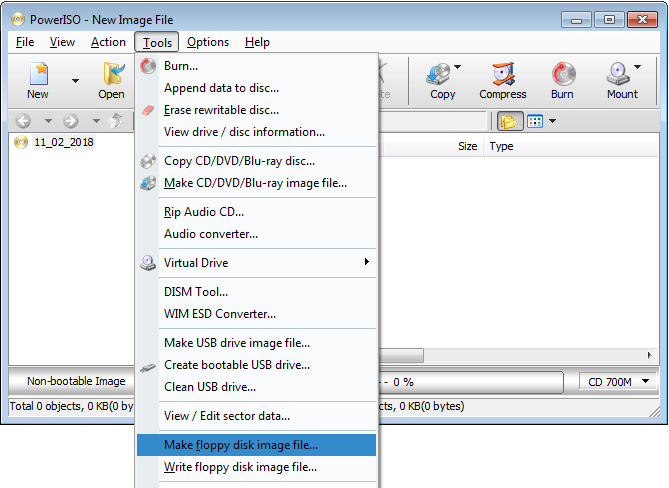 PowerISO can make floppy image from floppy disc, create floppy image file from files in local folders, edit floppy image file, or write floppy image file to a floppy disc. Choose "Tools > Make floppy disk image file" Menu. PowerISO shows Make floppy disk image file dialog. Choose the floppy driver which holds the disc you want to copy, and enter the output file path name. 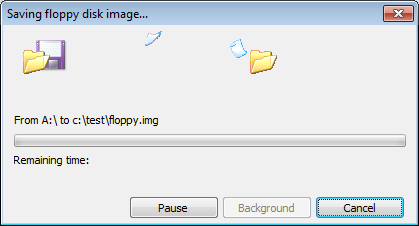 Click "OK" to start making floppy disk image file. After the operation completes successfully, you can open the floppy image file with PowerISO to browse or view files in the image file.